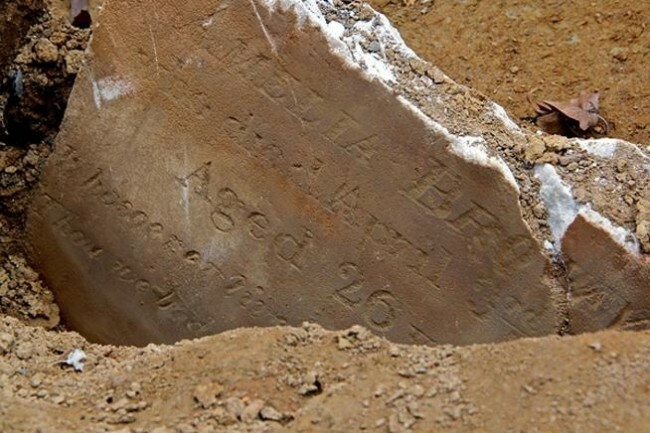 Three-year-old Ellen Sprigg died this date, September 17th, in 1845 and was buried at Bethel Burying Ground. Three-year-old Ellen Sprigg* died this date, September 17th, in 1845 of Hydrocephalus and was buried at Bethel Burying Ground. Osborne (~35) and Rebecca Sprigg (~24) lived at 201 Lombard Street in the rear of the building. It appears that Rebecca was Osborne’s second spouse. On April 30, 1833, Mr. Sprigg married Sarah Matthews at St. James Episcopal Church in Philadelphia. It is very possible that Sarah died in the 1830s, however, I cannot verify that because the vast majority of those death records have been destroyed. At the time of their daughter’s death, Mr. Sprigg was employed as a waiter and Ms. Sprigg as a laundress. The entire family lived in one room for which they paid $3.50 a week rent. This is equivalent to approximately $100 in today’s U.S. currency. The 1850 Federal Census lists the following Sprigg family members: Osborn (40y born in Maryland); Rebecca (29y/Delaware); Mary (11y/PA); William (10y/PA); Margaret (5/PA); Rebecca (3y/PA); James (15y/ PA) who was employed as a barber. The children attended the 6th and Lombard School. Five members of the family could read and three could write, according to the 1847 African American Census. In addition, this Census reports that Mr. Sprigg was a member of a Philadelphia temperance society. As of 1842, there were ten active Black temperance societies in Philadelphia. Black interest in temperance societies appeared as early as 1788 when the Free African Society refused membership to all drinkers of alcohol. Political and cultural forces solidly linked temperance to the abolition movement and the moral and civil uplifting of African Americans in the United States. By the late 1830s, the temperance movement had come to symbolize solidarity with the enslaved. Mr. Sprigg belonged to a large group of African American Philadelphians who believed that alcohol was used to debilitate and subjugate Blacks and suppress their desire to rebel against white racist society. Two hundred years later, the same accusations would be made against heroin and crack cocaine. Mr. Sprigg may have been one of the 1,200 Black men and boys who, on August 1, 1842, marched through the streets of Philadelphia celebrating both their liberation from alcohol and also the anniversary of the British abolishing slavery in England and in their West Indies colonies. In the southern part of the city, the parade was met by a white mob made up mostly of Irish immigrants that numbered at least double that of the Black paraders who were savagely attacked. There was a running battle of clubs, stones, knives, and guns until the Blacks were overrun. Then began one of the worst acts of ethnic cleansing that a northern city had ever witnessed to this point in U.S. history. Black paraders were killed and maimed. Countless homes of Black citizens’ homes were broken into, valuables were stolen and furniture destroyed. Many of their homes were burned to the ground. The Second African Church and the newly built Black temperance hall also were completely destroyed by fire. The Black community began to flee the city in fear of their lives and the lives of their children. The ferries to Camden, New Jersey were jammed with terrified families. However, the docks of the Delaware and Schuylkill Rivers were manned by the Irishmen who attacked the innocent as they waited to escape. Three days of unchecked violence finally prompted the mayor to call out seven militia units to restore order. The courts, the city government, and the press placed the blame for the violence on the Black paraders. They claimed that free Black men provoked the white mob who could do nothing less than react in the way they did. The toll of dead and injured Black citizens has never been accurately assessed. The above illustration is not of the Black temperance hall burned down in 1842. It depicts the burning of another Black-owned hall on May 17, 1838. A Gentleman of Color: The Life of James Forten, J. Winch; Forging Freedom, G. Nash; Philadelphia Stories, S. Otter; Tasting Freedom, D. Biddle and M. Dubin. ← The four-month-old Chapman child died this date, September 14th, in 1822 and was buried at Bethel Burying Ground.